These editions did not materialize. 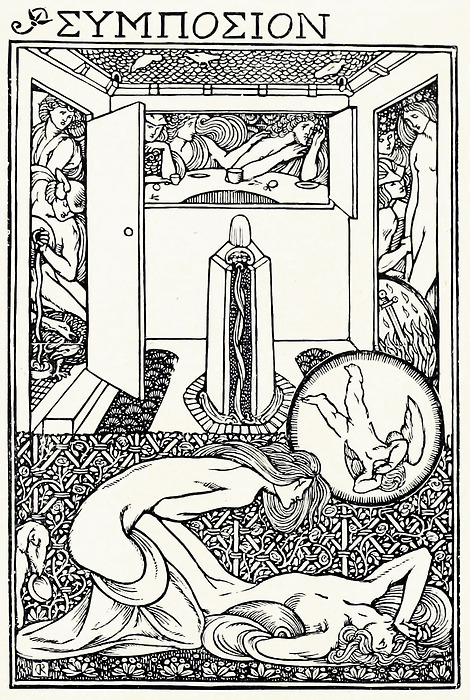 Earlier, Ricketts had mentioned the Plato edition to the American publisher F. Holland Day (a letter from October 1894) and, before that, to his new Dutch friend, the artist and book designer Richard Roland Holst, who visited Ricketts and Shannon in London at the end of the year 1893. Roland Holst wrote a long letter about this visit to his fiancée: 'hij sprak over Plato, dat hij de oude Eng. vertaling van de Symposium wilde uitgeven, met hoofdletters, en met een band die heelemaal bij dat wonder pastte...' Ricketts had told him about the Plato edition, for which he wanted to design initials and a binding that would fit the wonderful text. 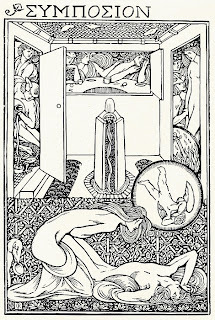 No initials, nor a binding design, have survived, but there is a silent witness of Ricketts's intentions: he finished one drawing (sold at auction in 1986, and, again, in 1997), he made the woodblock for the illustration (now at the Fitzwilliam Museum) and he printed at least one proof (now in the British Library). 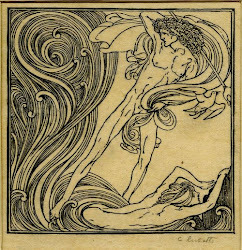 This illustration was published by Malcolm C. Salaman in The Graphic Arts of Great Britain, a special number of The Studio in 1917.